Cooking from scratch not only encourages healthier eating but can also help save money, and it may be better for the environment, especially if a home chef chooses sustainable ingredients when possible.67 The best reasons to cook at home are simple: it’s pleasurable and the results are often delicious. In fact, 80 percent of Americans say that they enjoy cooking. So why are people taking to the kitchen less regularly? Perhaps because it requires planning. A spin through the drive-through or stroll down the chip aisle is tempting when the cupboards are bare. Thus, a well-stocked pantry, refrigerator, and freezer can help make cooking on a regular basis easier and more enjoyable. The first step is to take stock of what’s already there. Nearly all food products can go bad, and less-than-optimal conditions can speed up the process. 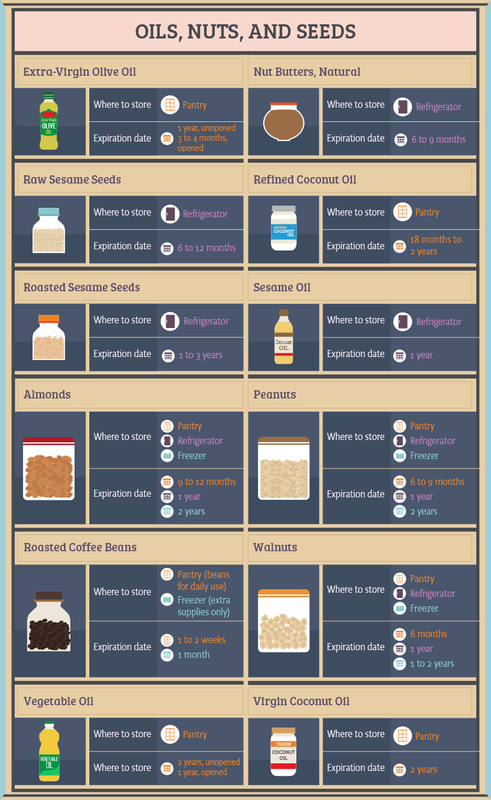 Take inventory by examining and smelling whole grains, flours, oils, nuts, seeds, herbs, and spices. Toss anything that looks bad, smells rancid, is expired, or has lost color or potency. Then list what needs to be replaced and what additional staples will make cooking easier. Focus on items that can be incorporated into multiple meals. Stumped? List 10 meals that you regularly prepare (or would like to) and the required ingredients. Though many items should be bought fresh, such as milk products and produce, almost everything else are excellent candidates to buy in large quantities and keep on hand in a pantry, refrigerator, or freezer. Use the following list of basic ingredients and storage tips to guide your own individualized inventory of essentials. 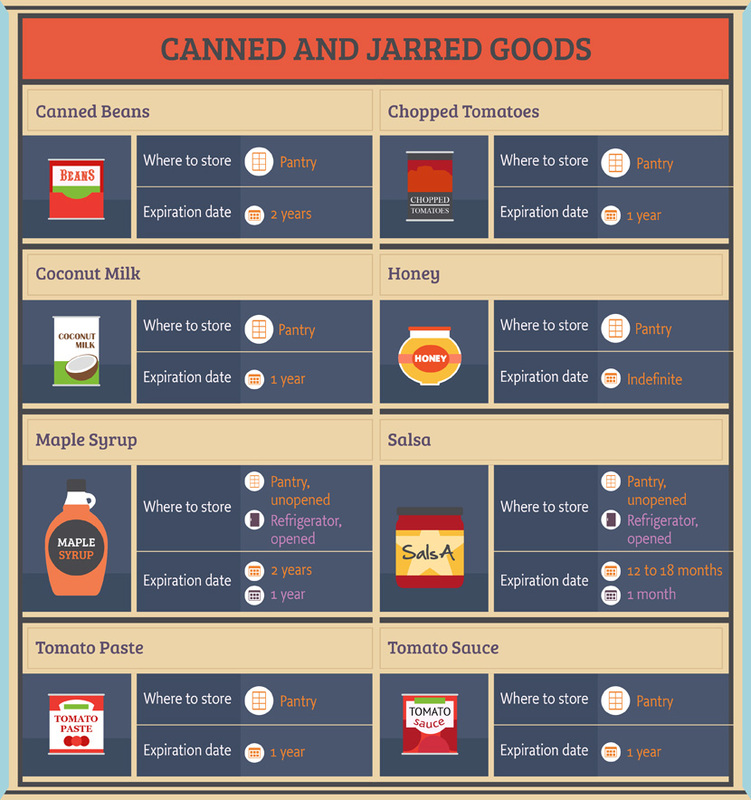 Note: the expiration dates are estimated assuming that a pantry meets optimal conditions. 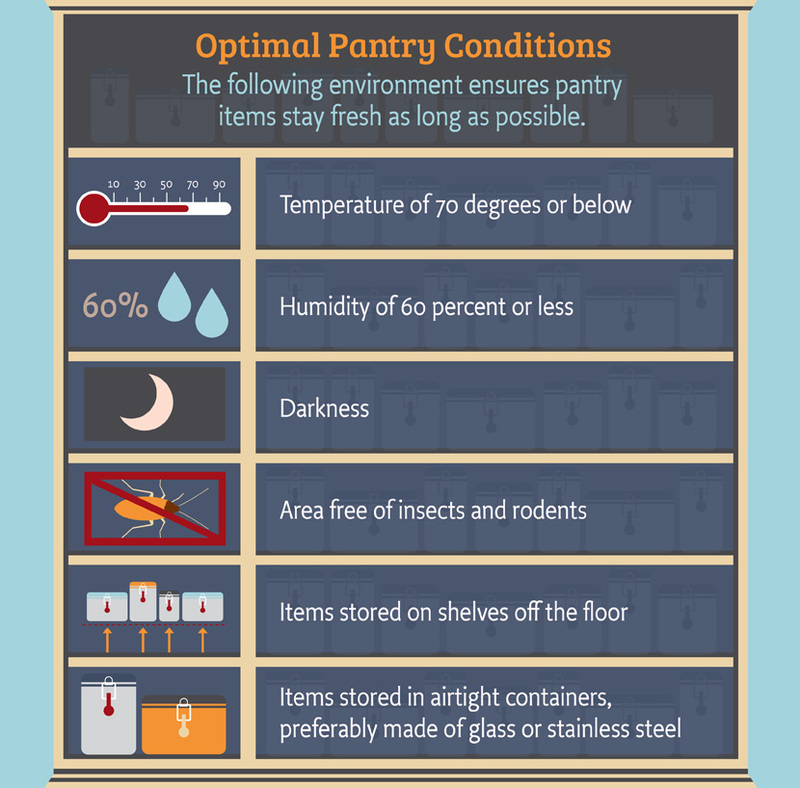 Food can have a significantly shorter shelf life in warmer, brighter, and humid environments, such as a cupboard near the stove, hot pipes, heater, or refrigerator. 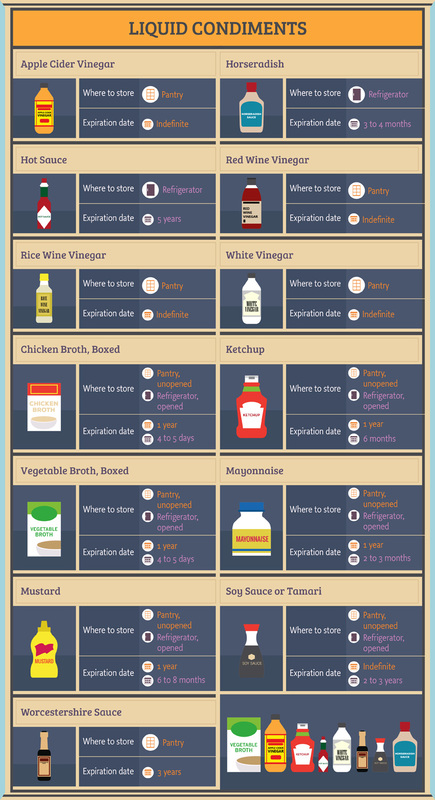 With a few exceptions (notably broth, mayonnaise, and horseradish), opened condiments can be kept at room temperature, but most of them retain flavor and last longer in the refrigerator. Store condiments in the door of the fridge, which is too warm for milk or eggs.12 Shake or stir before using. Store onions, garlic, and shallots in paper bags punched with holes. Keep potatoes in covered, ventilated baskets, boxes, or bags. They can be kept in the pantry, but for extended freshness, store them in a cold room, such as a basement, that stays between 40º and 60º. Once you have a list, it’s time to shop. Ingredients in grocery store bulk bins are often cheaper and fresher than pre-packaged ingredients. A local co-op, buying club, or wholesale club may offer even better deals on bulk items. 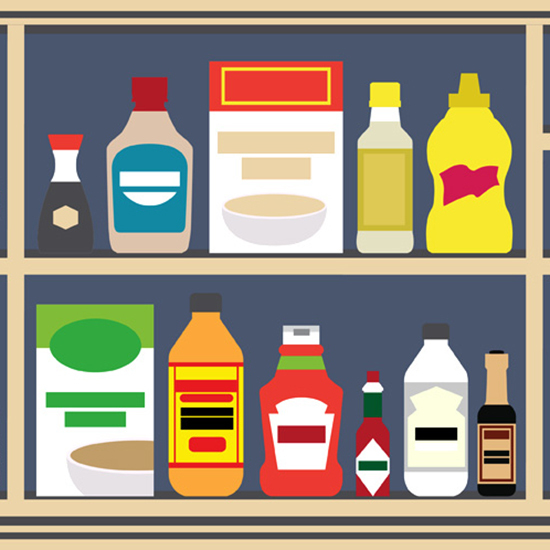 Filling up the pantry may feel daunting and expensive if the shelves were sparse to begin with. Remember, buying in bulk can save money in the long run, especially if it prevents pricy restaurant trips. But items must be stored properly – and used before they expire – to get the most bang for your buck. Create a system to take regular inventory and routinely replenish supplies. Tech-savvy home chefs can download one of the many pantry-management smart phone apps designed to help home cooks take stock of ingredients. Old-fashioned pen and paper works great, too. Just make a list of items that need to be stocked monthly, quarterly, yearly, and longer. Then routinely check the quantity and quality of supplies. Cooking is a creative pursuit that activates the senses and relieves stress.16 It encourages people to connect with their food and nature and gather around the table to savor delicious meals. A well-stocked pantry expands options and allows for inventive meals all week long.